Recommended by a friend with more experience brewing than me. To ferment 6 gallon batches, with some head space. The lid is a better design than the Big Mouth Bubblers. Looking for better primary option than standard bucket. Wide opening, headspace for fruit or no blow off tube required, has handles to easily lift when full. Best reviews and looks durable, appears well worth the price. I have the bigger one and love it. Need to replace a glass car boy. Right size for me and i'm tired of using buckets. I already own 1 and love it. Looking for an alternative to glass carboys but not ready to spend money on SS fermentation vessels. This winter is long and the temperature is perfect for brewing beer in my basement. Excellent primary fermenter. Wide neck makes dry hopping and cleaning a breeze! Already have two and they are the best. Swap the solid cap gasket for the spigot cap gasket and you'll get a much better seal. Capacity, construction, ease of cleaning, great reviews. Great reviews, I'm an avid homebrewer and want something with a larger mouth. Sound like it really does the job well. Does this unit include a threaded cap that will screw into the opening where the bung and airlock are inserted? I want to make sure I can completely seal fermenter if necessary in order to cold crash. BEST ANSWER: Yes, this fermenter will include one locking cap to seal the hole in the lid and/or spigot area. What's the height with the airlock in place? BEST ANSWER: Hi Thomas - The height with the airlock would be 21.25". The height with the airlock ends up being 25". I had a few people reply on facebook that have them already. What size (diameter) transfer hose do you use to rack? BEST ANSWER: Hi Scott. I purchased the upgraded port and you should too. The one that comes with these is pretty crummy. I use the 3/8 tubing. Just be sure to purchase the Butterfly Hose Clamp - 1/2 in. to clamp it on snugly, and be sure that the end that goes onto the spigot is dry so it wont slip any. I didn't at first and spilled some beer a few times while I was racking. Probably would have been a wise idea had I not drank so much too. Good luck! Can (or should) you use PBW to clean this? Also- is there a manual available for this? I have searched the Speidel Website but cannot locate one. BEST ANSWER: Hi Nathaniel - Yes PBW can be used to clean this fermenter but we would recommend to never use an abrasive scrub pad like the back of a sponge, brillow, etc. as it would scratch the surface and allow nooks/crannies to develop and harbor bacteria. As for containing the manual - it doesn't seem to, but you could search YouTube for "Speidel Plastic Fermenter - 30L / 7.9 gal" to get an idea of how to use one. Worked great for my first fermentation. However, you will need to mark the 5gal prior to filling, assuming you are brewing a 5 gal batch. Easier to work with, flexible options, large mouth, easier to carry than glass carboys. Downside - can't see in detail what is going on inside. You do see outlines, colors, sense of levels. Fermenting first batch - we'll see after i move it to secondary and clean the plastic fermenter. I have the 30 and 60L and I bought the larger one first as I want to brew 10 gallon batches. 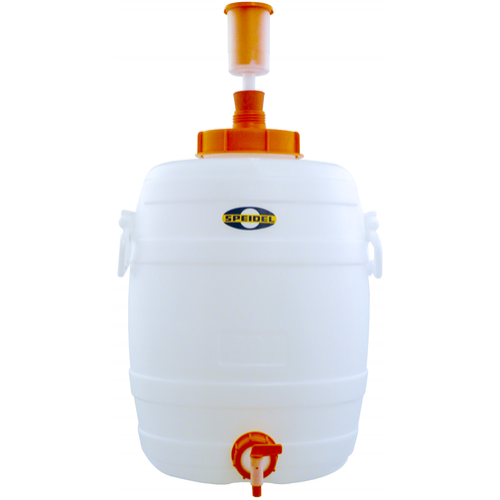 Just bought the 30L and fermenting saison as I write this review. Love the fact they are easy to clean. No auto siphon just add tubing and bottle or keg away. Trub settles nicely to the bottom. I wash some yeasts and these fermenters are the bomb for doing that. The plastic valves come apart for complete cleaning. So easy. Done with carboys. Just kegged from this today, and the spigot clogged immediately (it was a heavy hopped double IPA -- lesson learned after fighting with my siphon for 2 hours and adding way too much oxygen that way, to tip the fermenter so I don't get all the gunk there). The spigot was also an odd size -- too big for my normal bottling tubing, but too small for the 1/2 ID tubing for my kettle -- though again, it clogged. Somewhat hard to clean, even the outside. However, the handles are amazing, and it gives really good space for a big beer to ferment. My 6 gallon batch left a ton of room. I like the heavy duty airlock as well. I'm happy with the purchase, but likely won't buy another. Fast shipping. Very pleased with the fermenter, which also converts to a storage if needed. I just finished my first batch using this fermenter and I am completely satisfied with the purchase as it is very well made. If you do buy this, my only recommendation would be to fill it up one gallon at a time and mark the outside with a Sharpie prior to use. I used my old fermentation bucket to accomplish this. I can't knock this item one bit - great price and well made. Thank you so much for your feedback. That's a great idea to mark gallon increments on the outside. We really appreciate the honesty and value great feedback like this as it helps us improve our products. Cheers! I used Better Bottles for years and while they did the job for quite some time they began to crack after I switched over to using PBW to clean them. Not ready to spend the money on a conical or steel fermenter and not really necessary. I bought 4 of these and and they get heavy use and have performed well. I guess the only knock is that when you have used clear glass/plastic, going to a white plastic where you cannot see fermentation activity takes a little getting used. It is nice having the additional headspace and I have not had any messes with blow off when I split a 10-12 gal batch between 2 fermentes. Easy to clean and sanitize too. I plan on getting at least 2 more sometime soon. Thank you so much for your feedback regarding the fermenter. We really appreciate the honesty and value great feedback like this as it helps us improve our products. Cheers! I love this fermentor, used it many many times and never has let me down. Make a blow off tube for those big beers! The quality of this product is excellent. Rated four stars because no volume indicators and no instructions on how to use the airlock. Works very well, only concern is the amount of airspace above the 6 gallon level. But no apparent problems yet. Works great with air lock or blow off tube. Easy to clean. Bought this because I was tired of the effort and risk moving filled glass carboys around. Wanted something that would be easier to clean as well. Have one batch almost done fermenting now. Looking forward to racking the beer. I think that I will be able to use the 2-hole plastic carboy hood to rack the beer with CO2 pressure, as I previously did with my glass carboy. Big and sturdy with easy lift handles. Probably going to invest in another one of these. Well made. Large mouth is a great feature. - The spigot is an odd size. You can jam on a 3/8 ID tube after heating it up. Which mean you need to heat up the star san to soften it up. I find it an pain that could have been avoid. Also, there's not a ton of room for the tube on the spigot outlet. So you need to watch it in case it pops off during transfer. My favorite primary fermenters. Sturdy, built in handles, easy to clean, no siphoning. Wish they were clear, graduated. My husband has been using it and he seems to like it. Excellent product. 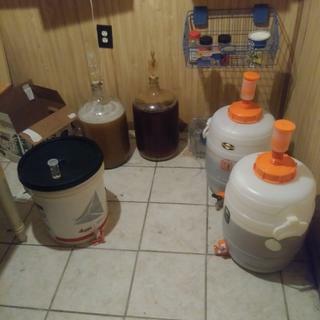 I stopped using glass carboys and now use Speidel plastic fermenters and storage containers. Works great, won’t break and easily cleaned. The 7.9 gallon version has an extra 1 gallon of head space for a total of about 9 gallons when full to the top. Tired of making due with rigged up fermenters? The Spiedel Fermenter is built to do what it does, and it does it well. So well, I bought the small 12L one to be a pressure barrel for cask conditioned ale. Hope that works out, but I can also use it for small batches. It is all of 30L plus. Thick HDPE.. It is nothing like a PET carboy. I brewed a milk stout for my first use of the Speidel 30L. Everything went as planned and I was able to bottle straight from the fermenter (using domino dots) with minimal sediment ending up in the bottles. I'm not a big fan of secondary fermentation so this fermenter works well for me. Two weeks fermentation/three weeks of bottle conditioning and the beer tastes great. The light weight of the fermenter, ease of carrying (nice handles) and height of the spigot (great for gravity samples as well) all result in a good product. Yes, it would be nice to have gallon markers but a sharpie and a few minutes of measuring a gallon at a time took care of this. I had to fiddle a bit with the bung to keep it in place but this can be an annoyance with a glass carboy as well. A hose barb shaped bung would be a potential design improvement. I might buy a second bung and score the outside so it catches on the opening. You can somewhat see the level of krausen. It's not as much "fun" as watching a glass carboy but the action in the airlock lets you know everything is working fine. Let's face it, you can't see through stainless steel fermenters and brewers have no problem producing good beer in those. Clean-up is a breeze but I had a residual smell that wouldn't rinse out. I've left the threaded cap off for a few weeks and the smell has dissipated considerably. A fellow brewer has run countless batches through his and assured me the smell will not influence future brews. Overall, a really nice product and quick delivery from MoreBeer. My suspicion is my glass carboys are going to be collecting dust. Really makes fermentation easy, with high quality plastic fermenter, very well built components and easy to use opening and carry handles. Will definitely recommend for ease of fermenting and fast cleaning! These are the best, most durable fermentation tanks this side of stainless steel. Large opening on top makes it easy to do dry hop additions and clean the inside. Very happy with this. Wish it were just a bit smaller since I typically make 5-gallon batches, but it is very well-made, easy to use, easy to clean, valve doesn't leak, etc. FYI, it takes a bigger stopper than a typical carboy. I like the wide opening for the ease of cleaning and the handles provide for easy lifting. Getting a good seal of the drain spout to the fermenter was very difficult. Plenty of head space for 5+ gallon batches. Easy to clean. Seals tightly. Fits in my Kegerator and mini-keeper. Can safely pressure transfer to kegs. Great fermenter for 5 gallon batches. I really like the handles easy to move around also pretty easy to clean after ferment. Excellent tool - I love it. Upgraded to the metal spigot. A great value. Works great and very easy to clean. Better than buckets! Perfect size for 6 gal batches and super easy to clean. Haven't used it yet, but I will in a day or two. Just started my harvest. I will write a new review when I put to use..
Works great! It's advertised as 7.9 gal but that appears to be the volume above the lower spigot. As I was marking out 1/2 gal increments on the side I was able to get about 9 gal into the vessel right at base of the upper threaded section that is integral with the vessel (the section that the large orange thread ring attaches to). Love the extra space for the larger ABV beers that krausen extensively. It is what it is, but I wished it was not so opaque so as to more clearly see what the beer is doing during fermentation. This is the only negative I see, if you even call it a negative. I have just begun to use this container, so my review is less valuable than others. Having said that, it is exactly what I expected, the containers and components seem durable. I hope it will work well as a simple inexpensive means of micro-oxygenating red wines. This is the best frermenter that you can get for the money! It’s solidly constructed, easy to lift and easy to clean. The 30 liter is also the best size for a 5 gallon batch with plenty of head space. 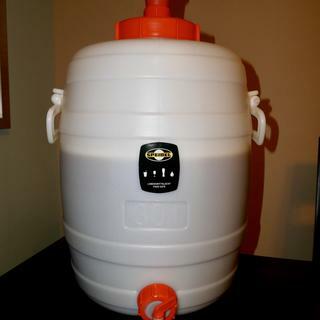 I’ve made both wine and beer with it, love this fermenter! Great fermenter. My first batch with this was a hefe, yes nice and messy as a trial by fire. It cleaned up easily. Skip right to this one as your first fermenter, you won't regret it. Overall system is well made. My only problem was with the spigot cap which leaked no matter how it was attached or tightened. To secure the spigot cap so it would not leak I swapped the gasket from the locking cap, which is a little beefier, for the thinner gasket in the spigot cap. 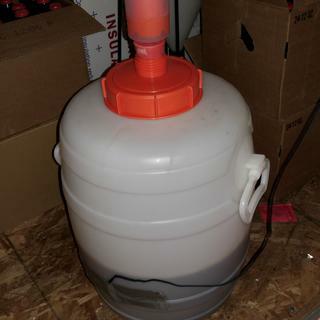 I have used many different kinds of fermentors, this has been the best! Easy to fill, clean & sanitize and pulling samples has never been easier. I have 3 now and have no plans in trying anything else. I like these because at my age my strength has diminished and with two handles helps me a lot. For a fermenter, this thing is built like a tank. Guaranteed to last a very long time. Will be purchasing more in the near future. Perfect for brewing new recipes in small batches. overall pretty happy with this one. i love how sturdy this thing is and the over sized airlock. The couple of things i would change with this fermentor would be to etch some graduation marks and rethink the gasket for the spigot. if you dont get some water in the vessel and mess with the seal, you will surely experience a leak. otherwise, a great value and will get plenty of use! Great primary for 5 gal batches. Great product! Very sturdy and superior to any fermenter I’ve ever used!